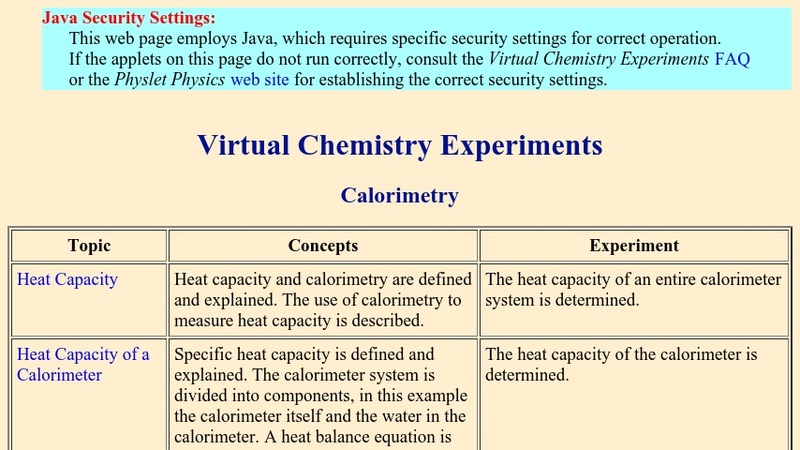 As part of a larger collection of virtual experiments, this link deals exclusively with the fundamentals of Heat Capacity. A bomb calorimeter is shown and the user is allowed to used a desired amount of materials to measure the heat capacity of: 1) ethanol; 2) copper; and 3) ammonium nitrate. Heat of neutralization reactions and combustion reactions are also explored. Nonideal loss and gain of heat during calorimetry experiments are explored by measuring the heat of solution of sulfuric acid. Strategies are also discussed for studying systems in which two chemical reactions simultaneously occur.